The artwork featured in this year's Easter poster portrays Christ and the apostles from the life of Christ frescoes in the Church of Santa Margherita, Belluno, Italy. We publish the flyer written by the Latin American Communion and Liberation communities in response to the social, economic, and political crisis in Venezuela. More information on the upcoming "The Life of Luigi Giussani" book tour with Alberto Savorana. Visit the tour's official website to remain up to date. Official message from the CL Press Office following the confirmed conviction of Roberto Formigoni. From March 9 to March 19, across the United States and Canada, several noted journalists, educators, and clerics will join Alberto Savorana for ten roundtables to share their insights into the relevance of Giussani’s life experience to today’s context. Understanding how to begin again in our daily chaos through interventions by the Papal Nuncio, Julián Carrón, David Brooks and poet Paul Mariani among many others. The New York Encounter gave us three days to rediscover what the heart is and Who makes it. On February 15-17 in the heart of Manhattan, New York, the 2019 edition of the New York Encounter will take place. We publish an overview of its upcoming highlights. Thirteen years from the death of Fr. Giussani and thirty-five from the recognition of the Fraternity of Communion and Liberation, Masses will be celebrated worldwide with the following intention. 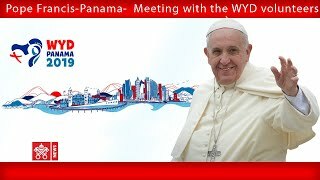 At the end of World Youth Day, Pope Francis met the volunteers who made the event possible. Watch his address here. On the morning of January 31, Fr. Carrón's mother, Ms. Andrea Pérez, passed away. Fr. Carrón wished to personally inform his friends in the Movement with the following message. The communities of Northern Europe gathered in Reading, west of London, for a weekend with Julián Carrón. They spoke about work, family, the drama of death. It helped everyone face the challenges that do not spare anyone in our society. In the January 2019 Issue of "Traces"
A short overview of the January 2019 issue of Traces, "The Charity that Builds." Madrid: Recording of the Presentation on "El Abrazo"
Fr. 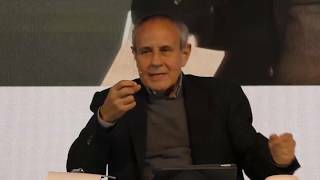 Julián Carrón, Joseba Arregi, and Mikel Azurmendi present Azurmendi's book, "El Abrazo." "Migrants are not just numbers. They are people, personal stories. "An interview with Fr. Julián Carrón on "Il Corriere della Sera." There are still eleven days to sign up to volunteer for the 2019 New York Encounter which will take place on February 15-17, 2019.